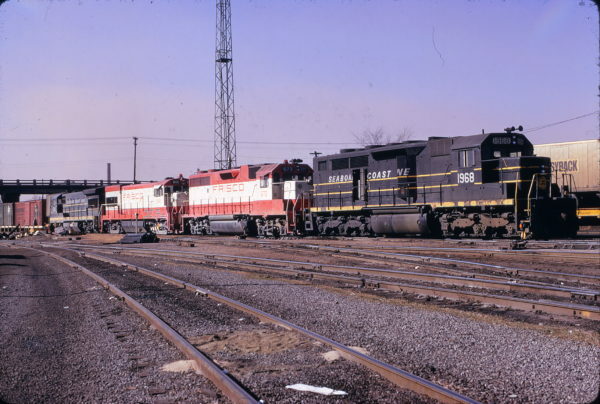 GP38-2 673 and U30B 846 at Birmingham, Alabama on December 22, 1973. (W.B. Folsom). Also included at no additional charge is Seaboard Coast Line SDP35 1968 and U36B 1780. 1968 is a dual purpose SDP (Special Duty (6 powered axles) Passenger (steam boiler equipped)) locomotive built by the Electro-Motive Division of General Motors Corporation. In grand total only 35 units of this model were built for 4 railroads (SAL 20, ACL 1, L&N 4, UP 10). At the time of construction, the number of passenger trains was declining and the end of passenger service was in sight. This model was intended to replace aging E and F type units in passenger service, but could easily be reverted to freight service. This unit was constructed in November 1964 for the Seaboard Air Line (SAL) as their locomotive SAL 1117. On this line it was one of a group of twenty similar model units (SAL 1100-1119). On July 1, 1967 the SAL merged with Atlantic Coast Line (ACL) to form the Seaboard Coast Line (SCL). After this merger the locomotive was renumbered for dual passenger and freight service as SCL 618. After the railroad ended passenger service and Amtrak started it was renumbered to SCL 1968. For a short time after its formation on December 29, 1982, the locomotive was owned by and renumbered for the Seaboard System (SBD) as SBD 4597. This later number signified a third change in use with its assignment to a group of locomotives in heavy yard switch engine service. Later on July 1, 1986, the Seaboard System railroads (SCL, L&N, CRR, A&WP, GRR) merged with the former Chessie System railroads (B&O, C&O, WM) to form the new system of railroads, “Chessie Seaboard Transportation” (CSXT). Although the same number was blocked out for the unit, it was skipped and not used as the locomotive was retired prior to being assigned and renumbered to the CSXT 4597 slot. The locomotive was retired on June 14, 1985. It was used as a trade-in unit for new locomotives coming from EMD. Unfortunately it was subsequently scrapped. A sister unit has been preserved, painted SAL 1114, and is on display next to the depot in Hamlet, North Carolina. In the photograph it is easy to make out the rear car body squared end, vents and air intakes of the steam boiler compartment. This necessitated the rear steps be reconfigured to a vertical, more ladder type, orientation. This is in contrast to the “standard” inset well steps as seen at the front of the locomotive. Below the frame, between the trucks, is a two compartment combination fuel and water tank. For rail fans and modelers, this locomotive was a Phase Ib2 unit. The phase designation recognizes largely car body variation spotting characteristics. EMD recognized model designations only and did not use “phase” designations. It rode on FC-1C trucks.